Upstate NY HAM Radio News & Information: Great Radio publication! 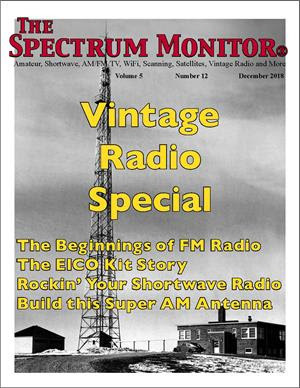 I recently received my December issue of The Spectrum Monitor (TSM). I really look forward to getting this publication each month! I am a charter subscriber since its beginning in 2014. It is very similar to the former Monitoring Times magazine which discontinued publication in 2013. TSM is usually around 100 pages and is packed with the latest on Amateur Radio, Shortwave, Scanning, Satellites, Radio/TV, Vintage radio, etc. The news and articles are always up to date and relevant. TSM is available only in PDF format and can be read on any device capable of opening a PDF file. I read TSM both on my tablet and PC. I also occasionally print out interesting articles that I might need for future reference in the shack.